Universities’ decisions to no longer require ACT/SAT scores and to award reverse-transfer degrees to students could make college degrees attainable for more students, according to Eboni Zamani-Gallaher, the director of the Office of Community College Research and Leadership at the U. of I.
Eboni Zamani-Gallaher is the director of the Office of Community College Research and Leadership and associate dean of the Graduate College at the University of Illinois. 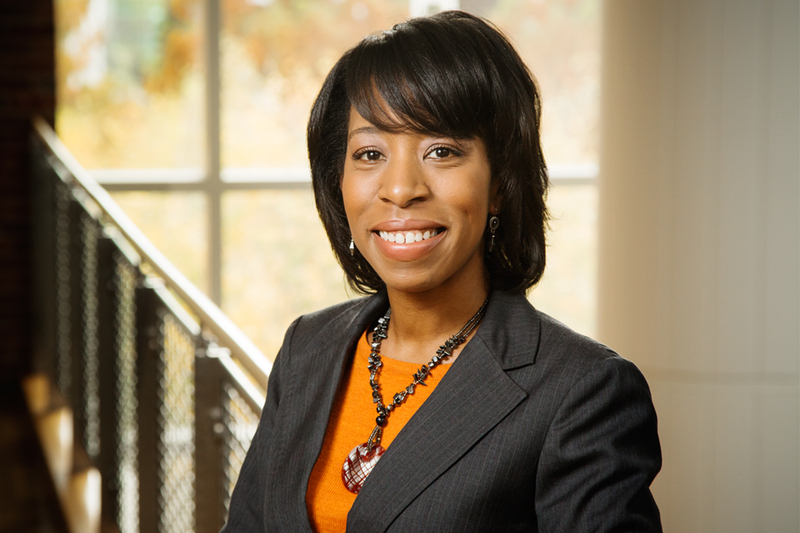 Zamani-Gallaher spoke recently with News Bureau education editor Sharita Forrest about the University of Chicago’s decision to no longer require applicants to take the ACT or SAT, reverse transfer degree programs and Facebook’s partnership with community colleges. The University of Chicago recently announced that it will no longer require applicants to submit SAT/ACT scores. Will discontinuing the use of standardized test scores in admissions potentially make postsecondary education attainable to a broader population of students? I was pleased to see the University of Chicago’s announcement. ACT/SAT scores are not the best predictor of persistence, and they reduce students’ merit to a narrow numeric score. These scores can be used inappropriately to evaluate applicants, denying opportunities for many capable students. Many students from underserved communities cannot afford the costly college prep courses that enable more affluent students to navigate the ACTs/SATs and improve their scores. And due to familial and employment obligations, many students don’t have the luxury of focusing on acing these tests. Arizona’s Maricopa Community College District recently announced a program for tracking students who transfer to four-year colleges and awarding them reverse transfer associate degrees when they earn the credits. What effect do reverse transfer degrees have on baccalaureate attainment? Reverse credit transfers are a promising policy, whereby university credits earned are sent back to the community college so that students are awarded an associate degree upon meeting the degree requirements. Swirling perpetuates lower degree completion rates, particularly among disadvantaged students. New routes to degree completion such as reverse transfer are needed. Students need multiple on and off ramps, less rigid and nimble attendance models, and institutional policies that meet the needs of diverse adult learners. Reverse transfer is one example of how institutional models can improve the portability of college credits, refine articulation agreements and increase community college completion rates. What have your researchers found in studying Illinois colleges that utilized reverse transfer? In our study, which was funded by the Illinois Community College Board, OCCRL researchers found that institutions rely on an opt-in consent process for reverse transfer. Reverse transfer at Illinois institutions was described as moderately effective by two-fifths of survey respondents, and the number of degrees awarded through reverse transfer in Illinois has been modest. Transfer coordinators for both two- and four-years institutions tell us that determining course equivalencies is a complex and time-consuming process; however, the development of a course equivalency database would be beneficial. The findings also indicate that new strategies are needed to communicate degree audit results with potential graduates. Further research is needed to understand why some students who are eligible for an associate degree opt not to complete it, despite the labor market value and potential returns to them. Facebook is partnering with 15 community colleges to offer a digital marketing certificate – and perhaps a full degree – using a curriculum that Facebook developed. Is this a viable alternative for community college students and a potential model for other postsecondary institutions? Facebook’s partnership with community colleges reflects what the two-year sector has always been responsive to, which is industry needs and workforce development. In today’s market, businesses’ bottom lines are greatly impacted by social media. Hence, it is not surprising that Facebook would develop and offer postsecondary credentials in digital marketing and advertising. Digital literacy is in high demand. Facebook’s program could prove fruitful by providing job-seekers and current workers with industry-recognized digital-skill competencies. It is a positive step, and given the high demand for these skillsets, these programs may provide a ladder to other credentials such as applied associate and baccalaureate degrees. I am sure other community colleges will be looking at their curricula to provide credit and noncredit courses in this area, even if they are not Facebook partners. Students enrolling in these certificate programs will need to make sure the curriculum is robust and industry-recognized. With many U.S. companies struggling to find skilled workers, do you foresee other companies developing their own postsecondary curricula to meet their needs for employees with specific skillsets? This has been going on for years. Soon after Facebook’s announcement, Google announced it was partnering with Jobs for the Future and more than two dozen community colleges – in California, Illinois, Michigan, New York, Ohio, Texas and Wisconsin – to launch an information technology certificate. This is the latest wave of companies collaborating with community colleges to provide professional certificate programs in high-tech, high-demand fields.